We just came back from the Mazda Miata MX-5 20th birthday party here at the Chicago Auto Show where they trotted out past concepts, race cars, and most importantly, beer and sushi. We're inclined to say wonderful things about the Mazda Miata, perhaps even fail to point out the supposed refresh Mazda is touting isn't exactly... er, noticeable. It's a funny thing what beer and sushi will do. In any case, Mazda took a moment to celebrate all things Miata, pointing out it was twenty years ago here in Chicago where the first MX-5 was debuted to the world. Among the neat Miata's Mazda brought along that little blue one is actually the fourteenth to roll off the assembly line. February 9, 1989 marks a highly significant time in automobile history, and certainly in the life of Mazda. 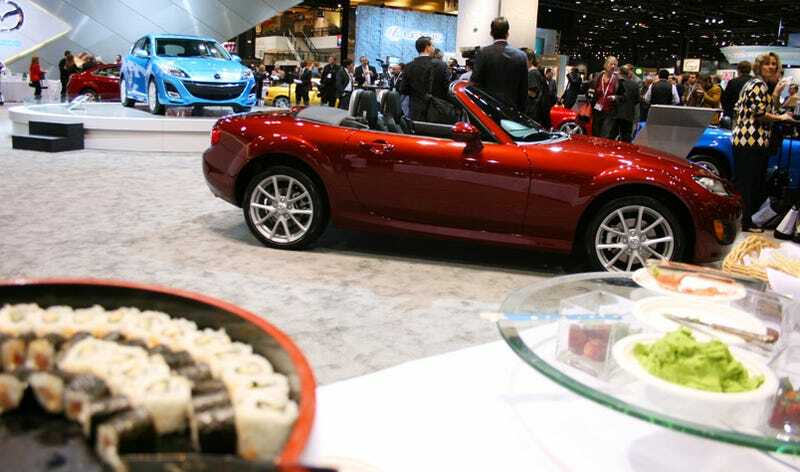 On that day, Mazda unveiled the MX-5 Miata to the world at the Chicago Auto Show. Since then, the MX-5 has become the world's best-selling two-seat sports car, and been listed in the Guinness Book of World Records as the most popular sports car ever built. Mazda MX-5 offers roadster driving at its best. The MX-5's original concept has been so successful that Mazda has never changed it: affordable to buy and use, lightweight, Jinba Ittai ("rider and horse as one") handling, and classic roadster looks. The Mazda Miata is the jewel of "Kansei Engineering," a deeply held philosophy that every car and truck that Mazda makes should be designed and engineered to provide strong emotional as well as functional satisfaction to its driver. For a unique sports car like Miata, whose sole purpose is pure driving fun, this objective is very important. Thus the Mazda Miata project team scorned "packaging" and "off-the-shelf" componentry per se, and instead began with a pure, bright concept of "America's ideal sports car." Miata has been heralded as saving the sports car world, has amassed nearly 900,000 global sales, and has won a total of 178 major automotive awards around the world. Two decades later, the MX-5 Miata is still a lightweight, balanced and responsive roadster that delivers the very best wind-in-the-hair driving at an affordable price. And because Mazda's engineers never lost sight of that "soul of a sports car" positioning for which the entire brand has become known, the MX-5 Miata also is the world's most-raced nameplate. A 1990 model launched in 1989, the original Miata featured a starting price of $13,800 and first went on sale in May in the United States, and in September in Japan. The first-generation Miata featured a 1.6-liter four-cylinder engine with 116 horsepower and 100 lb.-ft. of torque. A five-speed manual transmission was standard and City/Hwy fuel economy was 25/30 mpg. Suspension was by independent double wishbone on all four wheels, and braking consisted of four wheel-disc brakes with the front ventilated. Wheels were 14x5.5" steel or 14x6" alloy, both with 185/60 R14 radial tires. Important to convertibles is the roof operation. The Miata engineering team created a three-fold, easy-to-operate soft top, with one-hand operation, that was lightweight and offered superior weather protection. The coefficient of drag was 0.38. All together, the Miata weighed a low 2,116 lbs. (curb weight) and could reach 60 mph in less than nine seconds. When it was launched, the car created such excitement among buyers that demand exceeded production and became an instant success. The first change came in the 1994 model year. Miata was refreshed with a little more power through use of a 128-horsepower 1.8-liter engine. For the 1996 model year, horsepower was increased to 133 and a racing-themed R Package was also introduced with a Torsen® limited-slip rear differential, Bilstein shocks and front and rear spoilers. The second generation Miata was a 1999 model year vehicle. This new generation car offered a more powerful engine and new styling, including a new headlight design. For the first time the vehicle featured fixed headlights, which were lighter in mass in the dynamically critical front over hang, as opposed to the first generation's retractable headlights. In addition, the plastic window in the Miata's soft top was replaced with a glass window. The engine remained at 1.8-liters and received several updates. Power output and torque were improved to 140 horsepower with 119 lb.-ft. torque through enhancements to the intake and exhaust systems, resulting in smooth engine revving from low to high speeds and responsive acceleration with EPA mileage of 24/29 mpg. Features such as a straight intake port, a variable-inertia exhaust system and a dual exhaust manifold were incorporated. Compression ratio was raised from 9.0:1 to 9.5:1 with a raised-crown piston design. The base model could reach 60 mph in 7.9 seconds, with a top speed of 122 mph. Total weight of the second generation Miata was 2,200 pounds. A special limited edition model was introduced in 1999 to celebrate Miata's 10th anniversary. This model ramped up performance by use of a new six-speed manual transmission, Torsen® limited-slip differential and sport-tuned suspension with Bilstein® shock absorbers. A special Sapphire Blue Mica paint with blue soft top was also offered on the 10th Anniversary model. In 2000, the face-lifted second-generation MX-5 was launched as a 2001 model. Mazda added more horsepower, variable valve timing, a more rigid chassis and larger brakes. Additionally, 16-inch alloy wheels, a six-speed manual transmission, more aggressive styling and a host of interior improvements were available. The 2001 Miata delivered 142 horsepower and 125 lb.-ft. of torque with 23/28 mpg City/Highway fuel economy, and the compression ratio was increased from 9.5:1 to 10.0:1. With the minimum amount of options, the 2001 model weighed 2,387 pounds. In 2004, Mazda launched the turbocharged MAZDASPEED MX-5, with a 178 horsepower and 166 lb.-ft. of torque turbocharged and intercooled engine. The third generation MX-5 went on sale in late 2005 as a 2006 model year. Every single component on the car was either all new or extensively revised, and the new car looked it. The exterior styling was freshened, with the most noticeable change in the front fenders. Even though curb weight of the third generation Miata grew to over 2,400 pounds, the new car never forgot its roots and it was every bit as fun to drive as the original. And, regardless of the additional curb weight, fuel economy remained at 25/30. A new 16-valve, 2.0-liter MZR I-4 engine was introduced, producing 170 horsepower and 140 lb.-ft. of torque, coupled to either a five-speed or a six-speed manual transmission or 166-horsepower with the optional six-speed automatic transmission, while the five-speed manual model achieved the same fuel economy as the first 1990 Miata. A limited-slip differential was available with the six-speed option. The third generation Miata also produced a change in the suspension for the first time. A front wishbone/rear multilink suspension was used beginning with the 2006 MX-5 to increase ride quality and handling. Technologies like traction control and stability control were also added. In 2007, Mazda offered, for the first time, a new Power Retractable Hard Top (PRHT). Opening and closing cycles last only 12 seconds, making this the fastest power-operated retractable hard top in the U.S., and the only retractable hardtop on the market that doesn't compromise trunk space. Additionally, the PRHT adds only 77 pounds to the total weight of the car. July: undergoes minor change. 1.8-liter engine introduced. The second-generation Miata goes on sales as a 1999 model. January: Automobile Magazine names MX-5 to its "All Star Best Entry-Level Sports Car". April: Consumers Digest's "Best Buy"
December: One of Sport Compact Car's "Eight Great Rides"
July: Second-generation Mazda MX-5 Miata undergoes minor change for the 2001 model year. In addition to interior and exterior changes, the 1.8-liter engine gets a power boost, and body stiffness and other improvements add up to a greatly upgraded version. Mazda MX-5 Miata named Consumers Digest "Best Buys"
March: Third-generation MX-5 unveiled at the Geneva International Motor Show and is later debuted in commemorative limited edition format (Mazda MX-5 3rd Generation Limited) at the New York International Auto Show.